last week i decided it was time to clean out my makeup drawer. it had been a while since i had done a through toss and with picking up a few new products lately, i had to make room for those items. after a google search to see how long i could keep products before they go bad, i decided to come up with a pretty infographic to share my discoveries. some of these items are up for debate, like lipgloss and liquid liner. it could dry up before it technically needs thrown out. i left pencil liners off this list because if you keep your pencil sharpened, you shouldn't need to throw it out until it's gone. another little tip: keep your tools clean. makeup sponges should be replaced after a month as not to contaminate your makeup with any bacteria. makeup brushes should be spot cleaned every other day or so and deep cleaned every other week. lash curlers, sharpeners, and any other tools should be cleaned off after each use. 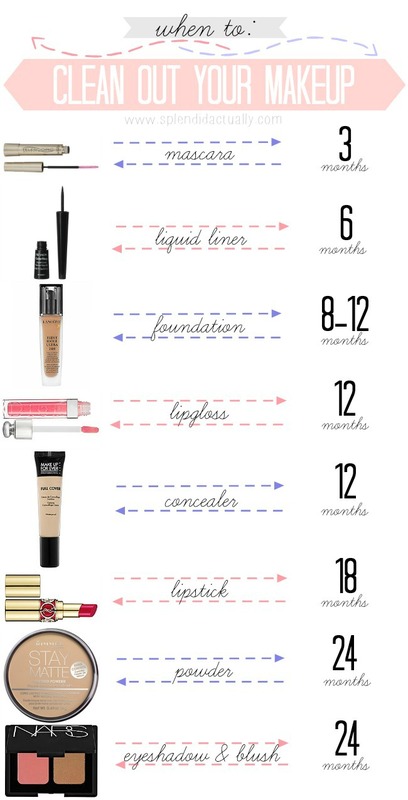 i know i'm guilty of keeping makeup around too long. anyone else out there? tell me i'm not the only one!